Learning how to chip properly is a great way to help lower scores and your handicap. It will allow you to attempt shorter putts once on the green which should improve not only your confidence but your ability to score. Developing the proper amount of touch around the green is something that does take some time to master. Also, just like putting, looking at the slope of the green and being able to effectively place your ball in relation to it is key. The chip shot is not all that much different that a putt, because many of the same components are present. 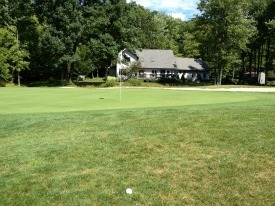 If you are new to golf, a chip shot is a very short shot from the fringe or rough directly around the green. There may be some confusion between a chip and a pitch shot for beginners, but the main difference is that a chip is typically a low, rolling shot around the green, whereas a pitch is from further away, and takes a higher trajectory to land softly on the green. When you are preparing for your shot, there are a few key things to look at such as the lie of the ball, distance that you need to cover, and the general slope and orientation of the green . As I mentioned above, many of the key aspects of effective putting are present with chipping. Being able to accurately judge the slope and pace of your shot is extremely important. Proper club selection before you chip is also very important. You may feel more comfortable with a wedge initially while learning how to chip because it is easier to control and you may have more immediate success. However, please realize that using a less lofted club will produce greater results in the long run once mastered. Even using a 9 or 8 iron will decrease the trajectory of your shot and will allow for more roll. Hone your skills at your courses practice area and get the feel for each club, and the results that it produces. Developing a good "feel" for the club is extremely important! The best way to minimize any errors while attempting a chip shot is to master the proper golf stance. When chipping, you want to hit down on the ball and you need a specific setup in order to accomplish that. Once you approach the ball, the first thing you need to do is align the ball with the big toe of your trailing foot. You do not need a wide stance while chipping. As you make your golf stance, it is important to have the majority of your weight going through your lead leg, as this promotes a downward swing. As you now have a solid stance, the next chipping tip is slightly moving the grip of the club 1-2 inches forward of the ball towards the target. This will take some of the loft away from the club and also promote a downward type swing. Reducing the loft of the club face will allow the ball to fly lower and roll further. Remember, the chipping stroke is more like a putt than a traditional swing. You want to move the club with your shoulders and arms while keeping your wrists still. This will allow your to have more control over the ball. Two of the most common mistakes that occur while chipping are either hitting the golf ball too fat or too thin. Hitting the ball too fat means that you didn't make solid contact with the ball, likely from hitting the ground, and that the ball travels only a short distance. Hitting the ball too thin means that you made contact directly with the blade of the golf club and the ball likely travels quickly and way past the hole. One final tip for learning how to chip: swing through the ball! Even though you are trying to create a downward swing, you do not want to chop at the ball. Swing through the ball like you would with a putt and you should see good results.